This is a notification of an improvement to how journals are identified in Brightpearl. It is important that you are aware of these changes if you are using Brightpearl accounting and/or have a private apps which read accounting data as they may need to be changed. From version 4.90 we will be introducing new finer-grained journal types. The Journal Type is a two letter code which identifies the type of transaction a journal entry represents. Currently the Journal Type JJ acts as catch-all for more than one transaction type. Merchants have told us that this makes these transactions hard to audit. To solve this problem, we have created a set of new journal types. Following the release of this change, JJ journals will only be used for manually entered journals. As soon as your account is upgraded to 4.90, Brightpearl will start creating the new finer-grained journal types. All journals created prior to version 4.90 will retain their old journal types. 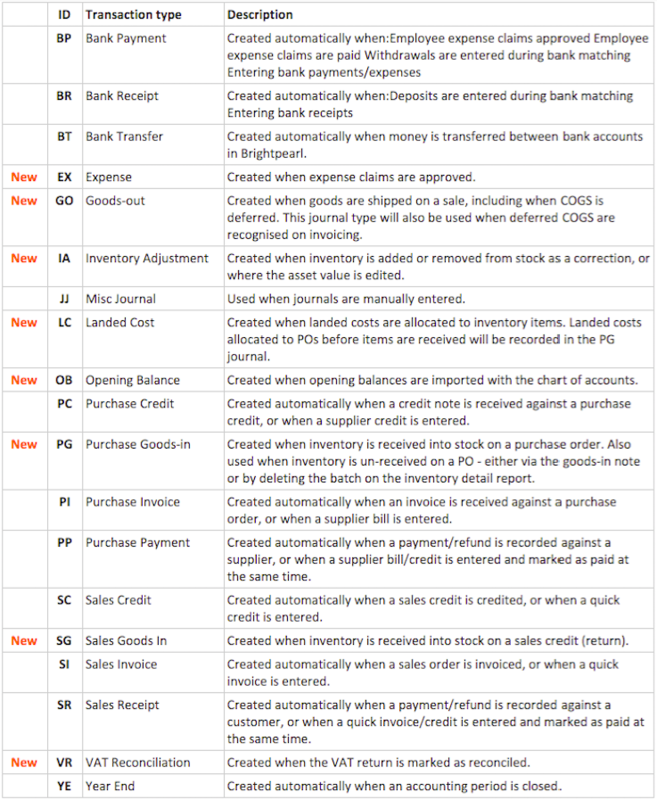 When looking at the general ledger by journal type you must be aware of the switch over and adjust the filters accordingly. If you have an app that draws on accounting data, we recommend that you get in touch with your developers as you may need to modify it to ensure it downloads and presents the new journal types. If they would also like early access to a test account in order to modify your app please raise a ticket with our Support team. If you have any further queries on these changes, please get in touch with our Support team.